Wadi Nisnas is more than a small Christian Arab neighborhood in the northern coastal city of Haifa -- it's a place full of culinary wonders. When I lived in Haifa seven years ago, I would make regular pilgrimages to Conditory Oriental for knafeh, a pastry of oozy goat cheese topped with crispy, bright orange noodles and rosewater syrup. Once, when I was at one of the neighborhood's most famous falafel shops, a Knesset member parked his car in the middle of the one-lane street in order to buy hummus. Honking ensued. The tiny neighborhood, whose name means "mongoose valley" in Arabic, is home to many churches and a great deal of public art, and is the site of Haifa's annual winter Holiday of Holidays festival, a celebration of Hannukah, Christmas and Ramadan. During the rest of the year, however, the neighborhood is still a pleasant place for a stroll, especially for the hungry. In the neighborhood's central market, you won't find purple carrots and the other gourmet oddities that appear in the markets of Tel Aviv. You will find all sorts of indigenous greens that feature in Arab cooking, including hubeizeh (mallow), olesh (chicory), mustard stems (apparently, you pickle them), green beet leaves, 10-centimeter-tall lentil sprouts and bags of cyclamen leaves for stuffing. Who knew you can eat cyclamen? There are also fresh herbs, olives for pickling, freshly roasted coffee beans, miniature vegetables for stuffing, excellent baklava and all sorts of pitas. The area is also home to a very large concentration of butcher shops. 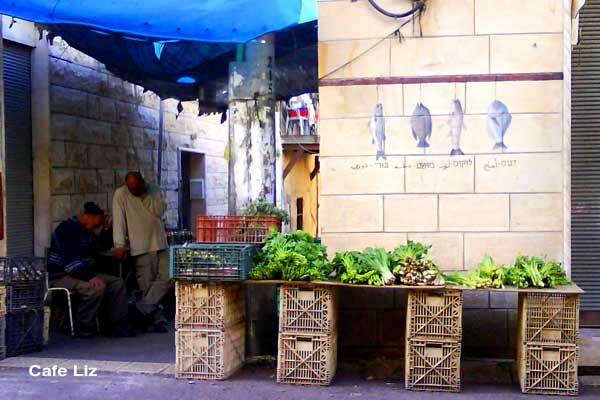 In the photo: Greens including mallow, beet, chicory and mustard stems, and an illustration of four different kinds of fish labeled in Arabic and Hebrew. Coming soon: A recipe for chicory. Abdelhadi Sweets (×ž×ž×ª×§×™× ×¢×‘×“ ××œ×”××“×™), Shehadeh Salah 3, Tel: 04-8513885/6. 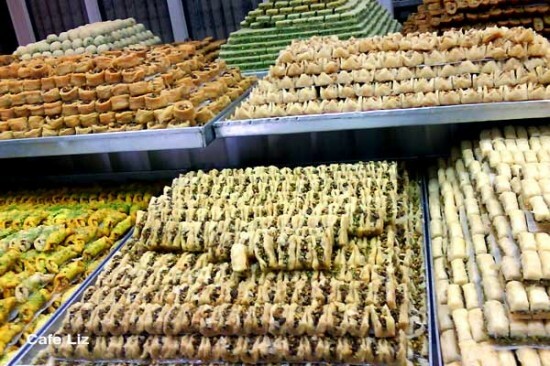 Large baklava shop with an impressive display of sweets -- meters and meters of them. Worth coming just to gape, even if you don't want to buy (see photo above). Baklava is 50 shekels a kilo. â€«â€ªConditory Oriental (×§×•× ×“×™×˜×•×¨×™×” ×”×ž×–×¨×—), Allenby 34, Haifa, 04-8523652. Smaller than Abdelhadi, this shop has a dozen or so types of baklava, plus excellent knafeh, for 10 shekels a slice. Pleasant to sit and eat. 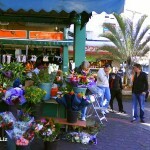 Market: Most of the market stalls run along Hawadi and Yohanan Hakadosh streets. 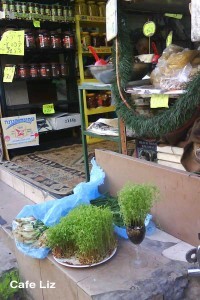 In the photo: Sprouted lentils at a shop on Yohanan Hakadosh. Khoury Bakery (×ž××¤×™×ª ×—×•×¨×™), Khoury 43, Haifa, 04-8517057. Small shop with a good assortment of Arab breads, including paper-thin Druze pita and laffeh-like Lebanese pita. Also on offer are vegetable-filled sambusaks and freshly baked regular pita. Cafe Haifa, (×§×¤×” ×—×™×¤×”), Hawadi 21, Haifa, 04-8537101. This small coffee roaster on the alley between Hawadi and Yohanan Hakadosh streets offers a few kinds of coffee, including the traditional Middle Eastern ground coffee with cardamom, for around 7 shekels per 100 grams. The Colombia coffee (10 shekels for 100 grams) is excellent. 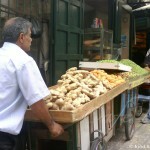 Next door is an olive and spice seller, reportedly known for his zaatar (hyssop) blend. Falafel Hazkenim and Falafel Mishel, across the street from one another at Hawadi 18 and Hawadi 21 respectively, are considered to be among Haifa's best-known falafel shops. Nadima Sabithi Eatery (×ž×–× ×•×Ÿ × ×“×™×ž×” ×¡×‘×™×ª×™), Yohanan Hakadosh Street, is a one-woman operation that Nadima, now in her 70s, has been running for 40 years (my source, an interview with Nadima in Hebrew). The day's offerings are lined up on gas burners inside, and include seasoned rice, majadera and mini-stuffed eggplants with a rice and meat filling, plus plates of vegetables including okra, spinach, mallow (hubeizeh) and chicory (olesh), for 20 shekels each. Not kosher, but very vegan/vegetarian friendly. 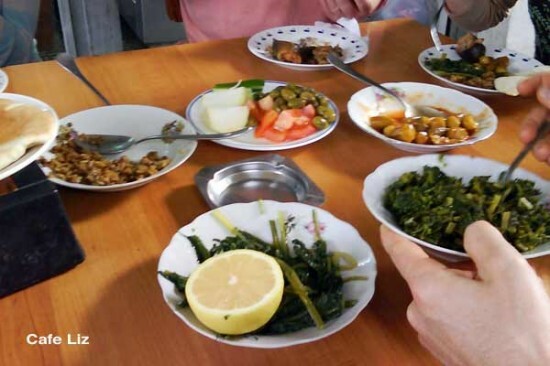 In the photo below: Nadima's chicory and hubeizeh, plus other dishes. Places I haven't checked out but have been recommended by others include the Swedan shop on 39 Allenby Street, which has been around since 1880; Samri's greengrocer on 41 Yohanan Hakadosh, where you can buy pre-hollowed mini-squashes ready for stuffing, and pre-trimmed okra; and the bakery on 48 Hawadi. Ynet has its own culinary tour and walking tour of Wadi Nisnas in Hebrew, Maariv's Signon explores the wadi in a quest to define Arab cuisine (also in Hebrew), and the Holiday of Holidays Web site lists even more food establishments in the neighborhood. You can find some history on Hebrew Wikipedia. 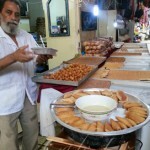 7 Responses to "A culinary spin through Wadi Nisnas"
What a good posting of that charming area! I love those greens, especially hubeiza,which I picked a lot while living in the north. I swear I’ve seen hubeizeh growing in central Tel Aviv, too … wondering if it’s too polluted to pick. Mallow is growing all over my neighborhood but I too am afraid it may be polluted. Would be fun to forage right here though. what a great culinary tour of the haifa shuk! nice pictures as well. It is funny they sell houbeiza as it’s all over the place, I have seen it in Nazareth shuk as well. I am reluctant to buy cyclamen leaves, it’s a protected plant and I am not sure of their origin. I guess they’re selling it for those of us afraid to pick it due to pollution concerns … I don’t know to what degree the pollution gets into the plant and stays there.